Best Trucks, Fully equipped, extreme maintenance. Best Service. PRIORITY RESPONSE Average 11 minutes . Polite, honest staff. BEST DISPATCHERS. Real people going out of their way. Heavy duty towing, Tractor switches, USA pick-up, Medium duty towing, Light duty towing, Flatbed towing, Un-lock service. Fast accident response. Tire change service. Machinery moving. Forklift rental and delivery service. Freight delivery. Scrap removal. Abandoned vehicles. References availalbe. 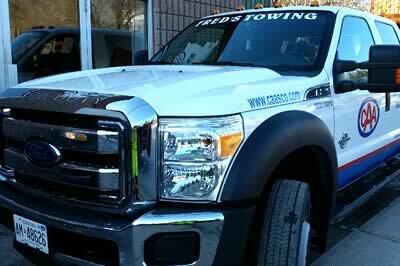 We look forward to helping you with any of your towing, shipping or hauling or anything else we can help with. Please give us a call for a competitive quote. We pride ourselves in superb priority responsive time. being on average 11 minutes for dispatches in Georgetown, Milton areas. 24-Hour Live Operator Services are standing by to answer your call any time of day or night. Junk removal for your home or business including offices, retail locations, construction sites, and more. Our team is ready to meet all of your junk hauling needs. Hi, my name is Rob Arsenault. 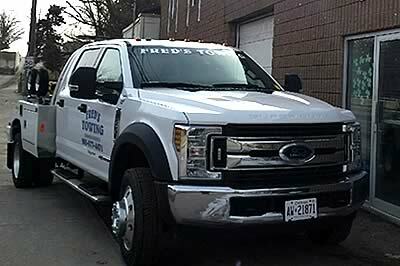 I bought Fred's Towing from Fred Tolton in 2002. It has been a challenge, but I've loved every minute of it, I love the business! Fred always said there are days you need 100 trucks and days you don't need any. Boy was he right. The inconsistencies of this business are like no other. That being said, we have come a long way in 10 years. From Terry and I working 24/7 to 14 trucks and 20 employees. But we are still a family business with wholesome values. 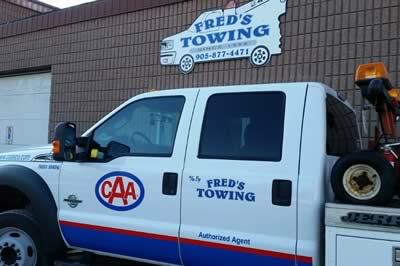 Fred built this business on honesty and integrity which seems to be in short supply these days. Everyone seems to be looking for the easy dollar, and are willing to break the law to get it, chasers sitting on the side of the road, listening to scanners and trying to find their next victim, cause us endless grief. Somebody once said: "if you love your job, you'll never work another day in your life" Towing is very much like that. It is not for everyone but those who stick to it, love it. No two days are ever alike and the learning never stops. We have towed fancy cars, school buses, brengun carriers, houses, boats, air planes, 16th century vase, loaded tanker trucks, snowmobiles, motorcycles, tool boxes, garden sheds, helicopters, Christmas floats, 53 foot trailers, x -ray machines, presses, lathes, hot tubs, and so much more! 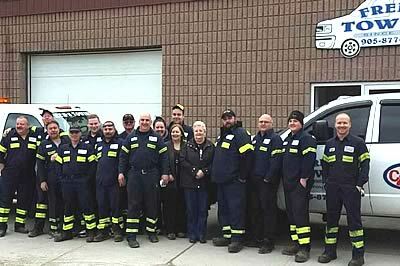 I have done tows to and from Florida, Texas, South Dakota, West Virginia, North and South Carolina, Kansas, Ste Saint Marie, Timmis, Longlac, Quebec, Ottawa and many other places. 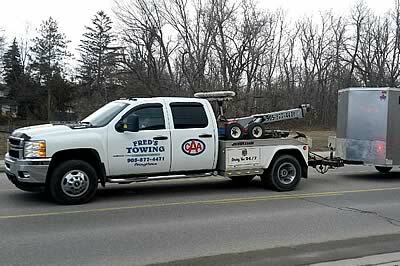 Number 1 rated Towing Service in Milton and Georgetown Ontario. 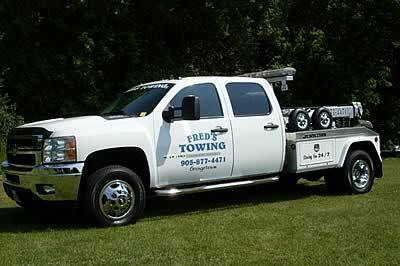 We look forward to helping you with any of your towing, shipping or hauling or anything else we can help with. Please give us a call for a competitive quote, from a full insured, bonded, honest group of people.